Kemal Gelchu & Co.'s Next Steps? If you think Kemal Gelchu & Co.’s mission is limited to spying on, taking over and sabotaging the Oromo struggle led by the OLF and killing the organization, please think again. Their mission is much bigger than that. It is all part of the widely known and much talked about TPLF diaspora policy. Targeted for destruction by that policy is not only the Oromo struggle. Abyssinian (Habasha, Amhara & others) diaspora opposition groups, including Ginbot 7 (G7), are among those marked for infiltration and sabotage by various TPLF spies. Kemal Gelchu & Co. is but one such group deployed by TPLF. The overall goal is to have diaspora opposition groups and liberation fronts silenced and surrender to TPLF where possible or saw discord among them to disrupt and frustrate their activities. To that end, the Oromo struggle was chosen both as an end and a means - as an end, in that the effort targets the Oromo struggle for destruction; as a means, in that the effort includes using the Oromo struggle as a gateway to Abyssinian opposition groups marked for infiltration. The plan, which Kemal Gelchu & Co. is entrusted with executing, is killing two birds with one stone. The two birds are the OLF & diaspora Abyssinian opposition groups; the proverbial single stone to be used to kill both of them would be the OLF political program. If there is one thing Abyssinians (Habashas) hate even more than they hate the TPLF, it is the OLF political program which calls for Oromo self-determination with the option of forming an independent state of Oromioa. This is a fact beyond dispute. For the Habasha, to defeat TPLF only to lose Oromia, the most fertile and richest part of the empire, would be to win the battle but lose the war. This is something no Habasha is willing to contemplate much less accept or compromise on. One way in which the Habshaa believe they would be able to achieve both of their objectives (defeating TPLF and keeping Oromia under the yoke of colonialism) would be to have the Oromo drop their demand for self-determination, and statehood, and join them in the struggle to depose TPLF from the Imperial throne. TPLF is keenly aware of this state of affairs just as we all are. Of course, it is working hard to infiltrate Abyssinian diaspora opposition groups directly as well. But, that is a pretty obvious strategy which the Abyssinians are aware of and are vigilantly guarding against. An even better strategy, however, would be to blindside them. The Abyssinian blindside, in this case, would be their obsession with having the Oromo drop their demand for self-determination. Any Oromo group willing to offer them “unity and sovereignty of Ethiopia” would be invited to alliances and even mergers. Within the country, MEDREK – which now includes Oromo People’s Congress (OPC) and Oromo Federalist Democratic Movement (OFDN) - is a case in point. Abyssinian diaspora organizations have not been as lucky. Having searched for such a group in the diaspora for many years to no avail, they think they have found one now. They are now beating the drum for Kemal Gelchu & Co – the Trojan horse approaching them with the promise of “unity and sovereignty of Ethiopia”. Little do they know that they are dancing to TPLF tune. Making predictions is always hazardous. It would have been nice to have a crystal ball in which to look and see the future. Having no such tool at my disposal, what follows is not a set-in-stone declaration of what will happen-- but rather what very well could happen based on Kemal Gelchu & Co.’s journey thus far as well as current trends. With that disclaimer, I will be looking out for the following scenarios to materialize in the near future. Having promised everything Ginbot 7 &. Co. would like to hear, including acceptance of a federal Ethiopia, Kemal Gelchu & Co. would propose some sort of alliance or a merger. It would be difficult for Ginbot 7 to turn down such a proposal for a couple of reasons. First, Kemal Gelchu & Co. has declared that the Oromo have no demand or question different and separate from that of other Abyssinians. That is exactly what Ginbot 7 has been preaching to whoever cared to listen. They have also accepted a struggle for “a functional and vibrant federal political structure” which Ginbot 7’s political program calls for. What reason would there be for Ginbot 7 to refuse a merger? Secondly, as an aspiring “multi-ethnic” organization, Ginbot 7 would love to have as many Oromos as possible associated with it to get a foot hold in Oromia which it is currently lacking. Why would Ginbot 7 not take this opportunity to extend its activities into Oromia region? Before such a merger can take place, however, Kemal Gelchu & Co. would insist on the future merged organization renouncing raising arms to achieve a political end and declaring “non-violence” as its method of struggle. This is necessary because Ginbot 7 has not done so explicitly. In fact, it refused to disavow raising arms in its political program by “emphasiz[ing] that “peaceful struggle” works in a society where the government respects the rights of its citizens to dissent.” No one can tell if Kemal Gelchu & Co. will succeed in this endeavor but given that Ginbot 7 is currently not engaged in one any way, it would not be farfetched to opine Ginbot 7 may be open to the idea. If they succeed, such a merger would give them opportunity to do more harm to the opposition group by spying for TPLF and sabotaging the merged organization’s work from within. Claiming representation for the Oromo people, they would occupy high leadership positions from where they can influence decisions detrimental to the organization and beneficial to TPLF. From such positions, they would gather information on the organization’s plans and activities to be transmitted to TPLF. At the same time, they would argue that “peaceful” struggle cannot be waged from afar and would work hard on convincing the merged organization to return home to lead the struggle from inside the country. The only way to do so would be to negotiate their return with TPLF who would provide them with a face saving concession which Kemal Gelchu & Co. – now part of the merged organization leadership - would accept after some feigned negotiations effort. If other members of the leadership of the merged organization formerly from G7 agree with the concession and decide to head home, then, this would be Kemal Gelchu & Co.’s ticket back home to a hero’s welcome from TPLF. Otherwise, this would lead to a split of the merged organization along Oromo/Abyssinia line enabling Kemal Gelchu & Co. to continue to cause confusion and turmoil in diaspora opposition organizations until such time that they are exposed and “defect” back to TPLF. Ginbot 7 would be well advised to beware of TPLF agents bearing the promise of “unity and sovereignty of Ethiopia”! Having failed to succeed in recruiting from within the OLF and having failed to convince any faction of the OLF to join its government, TPLF had to come up with a crafty plot similar to what the Greeks did to defeat Trojans. It recruited Kemal Gelchu & Co. to infiltrate the OLF, take it over and wreak havoc among diaspora opposition groups. As anyone with the slightest understanding of politics can see, it does not make sense for generals who purportedly left the employ of TPLF to challenge it by force to disband their army, renounce armed struggle before they fire their first bullet and adopt “peaceful struggle.” Nor does it make sense for their much loved and respected political organization to alter its political program which gained them public love and support and adopt one that is shown to have been rejected by the nation they claim to work for. On top of that, those who execute these changes are new comers to the organization – to the OLF. Where were they before joining this organization whose program and strategy they are changing? They were working for the enemy – the TPLF. Only an enemy agent would do what Kemal Gelchu & Co. did with the “OLF” faction they claim to lead. 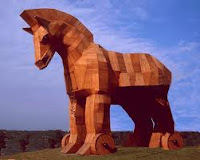 Only a Trojan horse would do such a thing! The Eritrean government is aware of Kemal Gelchu & Co.’s mission from TPLF. However, as is common practice in the intelligence world, it is using the enemy agents for its own ends (more on this at a later date) while monitoring and controlling their activities. Kemal Gelchu & Co.’s request for travel permits outside Eritrea has been consistently turned down by the Eritrean government regardless of the purported purpose for travel request. Even within Eritrea, their movement is very much restricted. Since their arrival, they have been under special surveillance 24 hours a day and are followed everywhere by Eritrean HUMINT agents. Their communication with everyone and anyone, inside and outside Eritrea, is being monitored and reported every day. That is how the Eritreans found out the plot (in or around 2007) by Kemal Gelchu and diaspora supporters to force out Dawud Ibsaa and alerted the later who was able to thwart the plot easily. Even every interview Kemal Gelchu & Co. give is scrutinized by Eritrean intelligence officers for code words or code phrases meant to convey messages to TPLF. Eritreans are very vigilant against infiltration. Are we, Oromos? Will Kemal Gelchu & Co., "OLF" Trojan Horse, accomplish its mission and go back to TPLF to a hero’s welcome? That is their plan but only time will tell! No serious observer of the Oromo people and their struggle for liberation over the last twenty years would doubt their abiding love and support for the OLF. That much, I argue, is beyond dispute. One cannot find a stronger evidence of the truth of this statement than pointing to the fact that the Oromo people stuck with it over the last twenty years even when it is at its weakest. Even Melles Zenawi, the arch enemy of the OLF, is said to have quipped “if you scratch every Oromo, you will expose the OLF in them” or something to that effect. This quip is one of the most telling testaments of Oromo love for the OLF. So, why is it that the Oromo people love this organization so much and refuse to abandon it even when it seems weak and ineffective? Why is it that no Oromo organization created since has been able to garner as much support as the OLF from the Oromo people? What has it done for them in the past and what has it promised them for the future? Most importantly, to tie it to the Kemal Gelchu & Co. story, how can one kill the OLF which seems to have nine lives and would not die regardless of uncountable attempts on its life or the number of obituaries written about its death? The Oromo people’s deepest love is not for the leaders or members of the day; Although they love and hold them in high regard too. They know that leaders and members come and go. Their love is for something constant, something persisting in the OLF regardless of who leads the organization or holds membership in it. That, my friends, is the ideals the organization represents; the fears, hopes and aspirations it is connected to. The ideals, the fears and hopes, and the aspirations it represents and stands for are the same as those that the Oromo people hold very dear. In fact, the OLF was formed for exactly that purpose – to represent and reflect Oromo hopes and aspirations. This is manifested in its political program. It is specified as dismantling the Ethiopian empire, freeing the Oromo people from colonial subjugation and enabling them to determine their fate with no external interference or undue pressure. Without dismantling the empire the Oromo will never see freedom and without freedom they won’t be able to determine their fate freely. When that opportunity comes around, while it advocates for independent state of Oromia, the OLF has promised them that it will respect and abide by their choice. That is what gained it so much love and support from them. Not only has the OLF reflected Oromo hopes and aspirations for liberation, it has also achieved for them, in a few decades, part of what they had lost for over a century. Paramount among them, it has helped lift Oromo identity, history and culture from the dust bin to which it was relegated by the Habasha colonizers and located it in its rightful place among the respected ones on the planet. I say helped because it is the Oromo people that did much of the lifting work through their organized and unorganized resistance. The OLF, however, gave that resistance and renaissance shape and direction. It organized and led it. The implication of that achievement alone on the Oromo psyche is incalculable. A book can be written about the impacts of this achievement. However, for the purpose of this piece, suffice to say that we would not have Qubee, or recognized as a nation without this achievement. OLF’s work is not completed by any stretch of the imagination. But, knowing what it has accomplished for them to date, the Oromo maintain confidence that it will deliver on its promises in the future as well. That is because they are mindful of the fact that past behavior is the best indicator of future behavior. The OLF has gone, and will go, through ups and downs, rainy and sunny days, disappointments and successes but at the end of the day, they believe, it will come through for them and will deliver on its promises as it has done before. Yes, it will stumble from time to time, it will even fall down now and then, but they are confident that it will pick itself up, dust itself off, and walk, even run and fly, again. Whether it is strong or weak at any particular time is not as important as what it stands for. Its point in time strength or weakness may be most important for opportunists among them but not for the vast majority of the Oromo people. Simply put, what the Oromo love is not OLF the organization per se. Their love affair is with OLF’s political program which is the embodiment of their hopes and aspirations. Without its political program, the OLF may exist as an organization, in name only, but without doubt will forgo the love and support of the Oromo people it has enjoyed since its inception. In order to kill the OLF, it is not enough to murder, to “disappear” or to torture its leaders or members. Nor is it enough to delegalize it or label it as a terrorist organization. Twenty years of such practices have not borne fruit for TPLF. The secret to killing the OLF is to deprive it of the love and support it enjoys from its people. That is the only sure way of burying the OLF six feet under. What better way is there to accomplish that than by decoupling and disassociating it from its political program? None at all! The sure way to kill the OLF, once and for all, would be to cajole, coerce or force it to abandon its missions and objectives as they are enshrined in its political program. Enemies of the OLF know this very well. After years of attempts at cajoling and coercing it to change its mission, and having failed miserably at it, they have devised a crafty scheme they hoped the Oromo would be unable to uncover. It is to infiltrate the organization, take it over and force it to abandon its political program so as to deprive it of Oromo love and support. But they needed an Oromo tool, a “Trojan Horse” to accomplish this mission for them. Say hi to Kemal Gelchu & Co., the lethal tool charged with this mission by the TPLF. What is more, they accomplished their mission by trampling upon the due process procedure enshrined in the OLF constitution which calls for the organizations general assembly to make such a major change. Usurping the general assembly’s power and circumventing that due process was necessary to achieve their mission. Without such illegal act, they were certain that their mission cannot be accomplished for they would be opposed by the vast majority of nationalist Oromos who had joined their faction duped by their sugar coated mantra of “change”. If the Oromo people’s aspiration were life in a “Federal” empire, they have had many organizations to choose from. First, there have been independent and “legal” Oromo organizations in the country that they could have supported and helped grow. These organizations have accepted a federal Ethiopia. The Oromo people, however, did not flock to join them and strengthen them. Secondly, the Oromo people have had the option of joining what Habasha’s call “multi-ethnic” organizations in the country. These are also “legal” and are working to remove TPLF from power. Twenty years after the OLF left the country, the Oromo people have refused to join these organizations. Why? Why have they decided to stick to an “illegal” organization labeled a terrorist and face assured harsh treatment at the hands of TPLF? The answer is simple. After twenty years of their refusal to join these other “legal” organizations in droves, it is fair to say that these organizations, although some of them seem independent and work for some Oromo interests, they do not represent the whole gamut of Oromo hopes and aspirations. The TPLF is very much mindful of this fact. According to TPLF even the few Oromos holding membership in “legal” opposition organizations, when scratched reveal the OLF in them. So what is the purpose of changing the OLF political program to realizing “New Federal Republic of Ethiopia.” knowing fully that other Oromo organizations who are working for the same ideal have not gained their people’s love and support after twenty years of existence? The purpose is to kill the OLF; deprive it of the love and support of the Oromo people it enjoys by changing its political program to one the Oromo don’t particularly care for. A “Trojan Horse” in the form of Kemal Gelchu & Co. was constructed and sent on this mission. Will they succeed? Only time and how the Oromo will react to these enemy spies’ actions will tell. This is the third evidence of Kemal Gelchu & Co.’s clandestine work for TPLF from within the Oromo movement for freedom. Continued in Part IV (Read Here).